Home » News » What is a Coil Spring? Ask ‘What is a coil spring?’ and first thought is likely the image of a Slinky walking end-over-end down a flight of stairs. Less likely, at least to the uninitiated, are thoughts of a mechanical device that has become an integral part of our everyday life. Though hidden in plain sight, you can find the coil spring, also known as the helical spring, everywhere, from toasters, retractable pens and playground toys to vehicular suspension systems, garden gates, and household furniture. In the modern world, the coil spring is truly indispensable. Types of springs have been around for centuries. In ancient Egypt, leaf springs were used by the pharaoh Tutankhamen on his carriages to provide stability and comfort. A stretched spring, perhaps the most widely used, are best exemplified by the bow and arrow, where the tension and energy found in the bow, i.e., the spring, is transferred to the string upon release of the arrow. Nevertheless, the principles of the coil spring were conceived by the 17th-century English scientist and philosopher, Robert Hooke. In 1660, Hooke’s Law explained the elasticity of solid bodies and the relation of tension and resistance when an elastic body is subjected to stress. His law, that the extension of an elastic object is directly proportional to the force applied to it, was applied a near century later when R. Tradwell received the first patent for a coil spring. However, not until 1857 was the first coil spring produced. That was made from steel wire for use in armchairs. Since then, the coil spring has found many applications, uses, and designs. They are made by bending a strand of wire into a multi-turn, helical coil. Through continuous turns, the strand of wire forms a helix that converts it into an energy storage mechanism. Three common types of coil spring designs are compression, extension, and torsion. A compression spring is an elastic coil, made of spring steel, or another non-ferrous metal, and is very efficient at building up energy when loaded. As the name suggests, the main characteristic of compression coil springs are to absorb force or provide resistance when the spring is being compressed. When in an unloaded state, the spring has space between its coils. When loaded, the spaces between the coils are compressed creating the energy to carry the load. To be effective, the coils of a compression spring must not be compressed to the point that the coils touch each other. This is a sure sign that the load is either too heavy or the spring is shot or both, and its service life has ended. 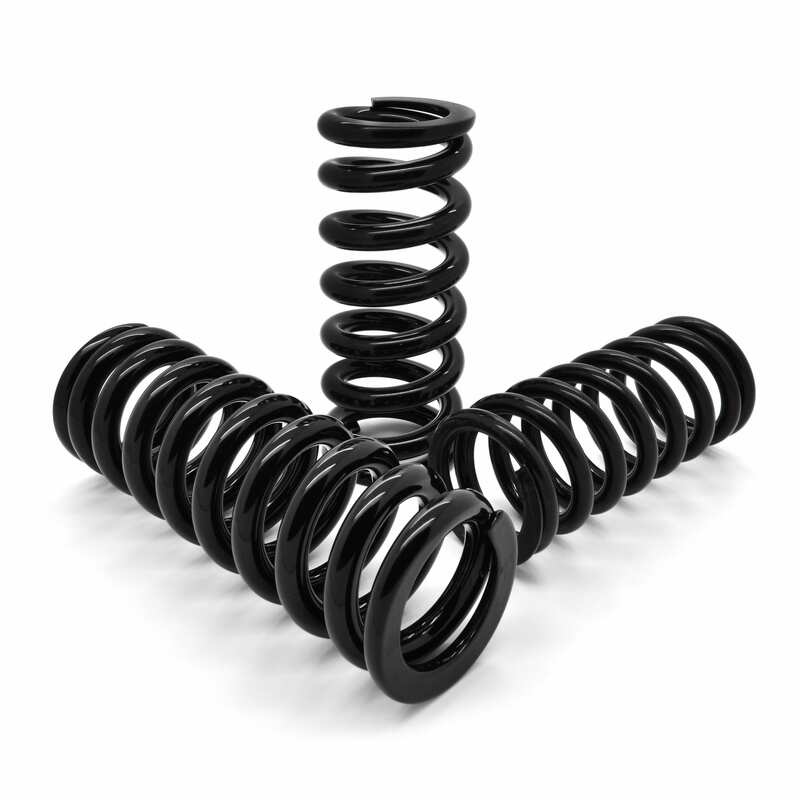 A compression spring comes in many shapes and sizes—conical, hourglass and barrel—and can be used as a shock absorber, vibration damper, a pure energy accumulator, or force generator. Compression spring applications include mattresses, medical devices, pens, notebooks, car suspension systems and pogo sticks. An extension, or tension coil spring, is named as such because the energy potential of the spring is realized through resistance when stretched or extended. Extension springs are coiled more tightly than compression springs. Commonly, they have an eyehook or simply a hook at each end of the coil for attachment to other components. When the spring is attached, the tension and resistance controls constant energy. The further the spring is extended, the greater the resistance and energy is released. Extension springs are found in farm equipment from tractors to combine harvesters, in washing machines to stabilize the drum, in many toys and most baby carriages, and they provide the bounce for trampolines. Instead of being compressed or extended, a torsion spring is coiled to store potential energy. Common applications for this type of spring are clothespins and mouse traps. Torsion springs obey Hooke’s Law, but the spring works at an angle and is designed to resist twisting actions rather than compressing or extending. With tension springs, torque replaces force, and angular distance in radians replaces linear distance. The coiled spring is a device that stores mechanical potential energy. In today’s world, springs are common and can be found in just about every industry. If you’re still asking yourself ‘What is a coil spring?’ contact us and we’d be happy to help! We design and manufacture standard and custom springs for industrial and commercial applications for Original Equipment Manufacturers (OEM).